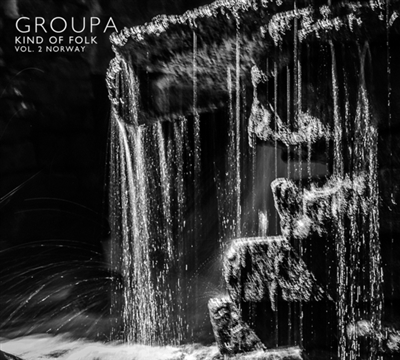 The next instalment in the Kind of Folk series by Groupa clearly demonstrates how this trio continues to reinvent Nordic folk music –this time, with a focus on Norway. Traditional melodies meld with innovative instrumentation and perceptive improvisation. This new release follows on Kind of Folk – Vol. 1 Sweden from 2016 which was nominated for a Swedish Grammy. The concept is based on music played at events ranging from weddings to funerals, from herding calls and "kulning" to the storytelling strains of Grieg. Quite often, the members of Groupa are inspired by dancing tunes by a lone musician. They then deconstruct each piece, tweak them from various angles and make them their own – often leaving just a trace of the original in their version. Among the 14 different tracks, we find hymns such as Syng i stille morgonstunder, a "slengpolska"– and a playful rendition of the piece most associated with Norway, Edvard Grieg’s Morgenstemning, which in Groupa’s version is called Kirkenes - Mandal: Spare and airy, even ambient. The theme is played on slabs of slate with all the reverence of the first time humankind made music. All three members of Groupa have a relationship to Norwegian folk music. Terje Isungset (percussion and jaw harp) was born in Norway and has played folk music since he was a boy. Jonas Simonson (flutes)was inspired by the tonal language, and by the long chainlike formations, "gangar" and "springer/springleik", in traditional Norwegian dancing tunes. Mats Edén (fiddles) has been intrigued by themelodies he heard from Norwegian fiddlers and Hardanger fiddlers. Later, he studied the Hardanger fiddle under Ånon Egeland and went on to catalogue music from the province of Värmland in Sweden and eastern Norway. Fiddler, ensemble musician, improv expert and composer: Mats Edén has had a huge impact on Swedish folk music since the 70s. His distinctive style, shaped by music from Norway as well as the province of Värmland in Sweden, is instantly recognizable – and it’s been one of the cornerstones of Groupa’s sound from the very beginning in 1980. A few highlights of his career include recordings and international tours with Tina Quartey, Ale Möller, Lena Willemark, Ellika Frisell, and the Gunnel Mauritzson band. Terje Isungset is one of the most creative improv percussionists in Europe. Described as ?the personification of extended percussion?, Isungset is known for crafting instruments out of unexpected materials: stone, metal and wood. In 2001 he released the world’s first album of ice music. Terje Isungset has nine acclaimed solo albums to his name. He plays drums, cymbals, bukkehorn (“Billy-Goat Horn'') and jaw harp, and he’s been commissioned to compose music for films, dance performances and festival events. With tonal and rhythmic precision and richness, Jonas Simonson is one of the most innovative flute players on the Nordic folk and world music circuits. For the past 30 years, he has travelled the globe with his music. Simonson’s versatile and highly personal style of playing has influenced the innovative Swedish folk music scene and he is featured on numerous recordings. Among his many projects are the Crane Dance Trio, Den Fule, Bäsk and Kapell Frisell. In addition to all this, Jonas Simonson is a highly respected educator at the Academy of Music and Drama at the University of Gothenburg.